It is middle June, early evening. Rich and ripe the earth, jungle green , with the rain. Lightning generating ozone, freshness. Electrons dancing with oxygen. We are electric water beings. The photo below is an aerial of the northeast corner of Cedar Lake. The lake and cattail marsh are posterior right. On the far left are the trails of the Kenilworth Greenway, along with a heavy rail line presently carrying light traffic. This corridor is the proposed route for the 14.5 Southwest Light Rail Transit line connecting Eden Prairie and downtown Minneapolis. In the foreground are the Cedar Lake Trail restored prairies, established in 1995. A glimpse of the Cedar Lake Regional Trail, the first commuter bikeway in the country, can be seen in the front right of the photo. Located in the center is the Heart of the Park. 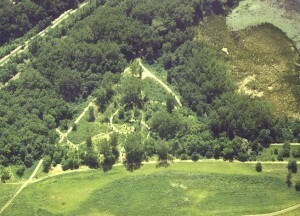 Within the triangle formed by old rail yard service roads, now walking paths, is the Memorial Cedar Grove. The Grove was established in 1996 when a dedication ceremony was held, and the first trees planted in a double spiral arrangement radiating out from a central point. It was completely an “accident” that the center of the spirals is located in the the center of the triangle. 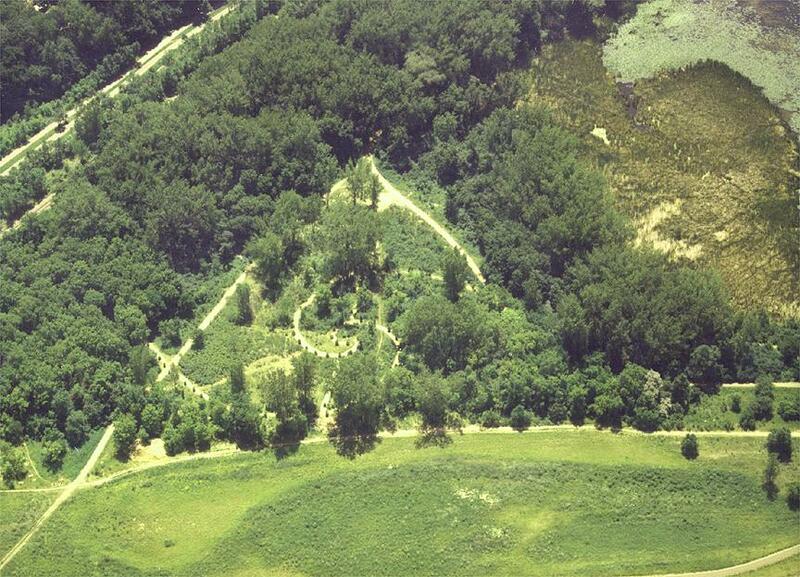 In addition, the grove is oriented as a henge, with lines established in the 4 directions, as well as the sunrise and sunset on the summer and winter solstices. I was out riding my bike this morning. Where I live, there are many neighborhood paved trails that connect parks and other wilder landscapes where birds abound, people walk, and there are many varieties of plants. I enjoyed myself immensely, and had a good workout before the temperature soared. As I passed through a parking lot, I noticed many acorns on the ground. Looking up, I noticed the source: Quercus Alba, or White oak. Its inner bark has long been used to promote tissue healing due to its astringent properties. I peeled an acorn, and bit into it. It lacked the tannic bitterness of some oaks, but would benefit from roasting. Ground, acorns make a high protein flour. Nearby was a familiar shrub with clusters of purple berries. Elderberry is used for lung ailments, thinning mucus and strengthening breathing. The branches can be hollowed for pipestems, while the berries can be jammed. Below on the ground was plantain. Its’ two inch broad green leaves, chewed to create a wet pulp are the best wasp and bee sting antidote I know. Place it on the bite as soon as possible. Plantain is common in lawns and disturbed ground. There are many plants that have been used medicinally since ancient times. Be careful to be sure that you are correct in your identification, use small amounts at first, and you will find Phytoceutical medicine useful and fun. Chiropractic is the art, science and philosophy of identifying and removing blocks in the flow of energy throughout the nervous system. 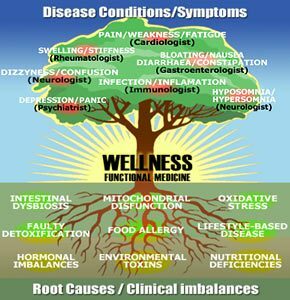 We are applied neurologists employing a variety of tools, ancient and modern, to promote health and wellness. Chiropractors bring our hands to the human body. Everyone of all ages and conditions can benefit from chiropractic care. No longer is Vitamin D considered just about Calcium and bones. The minimum requirement used to be 400IU/day, enough to prevent the bone disease Ricketts. Vitamin D receptors have been found on and in several organs, such as immune cells, brain, gastro-intestinal lining, kidneys, muscles, as well as bone. Functioning as a chemical messenger and pro-hormone, Vitamin D deficiency can be part of a host of conditions of ill-health. It is obtained in the diet predominantly in seafood and fortified dairy products. It is suggested that 20 minutes of sunshine per day on bare skin will produce adequate Vitamin D. However, this assumes that you are actually capable of doing this, and does not consider the lack of sunlight during our northern winters. For instance, there is more multiple sclerosis(MS) in the northern latitudes, and exacerbations are more common in the darker months. In my opinion, establishing baseline Vitamin D levels is important, and can easily be obtained through a simple and inexpensive blood test. Any woman with bone loss, or anyone with chronic pain should consider evaluation and supplementation if necessary. We are excited to announce that we now have the ability to order our own lab tests of blood, urine, saliva, breath, and hair. The panels are superb, better than anything I see people bring from their medical doctors. Inexpensive, with the drawing location easily accessible from anywhere in the Twin Cities. Laboratory analysis give us the ability to establish baseline biomarkers, to track improvements towards optimum levels, and to rule in/rule out serious disease. Here you will find offerings about many areas of healthy living. Our mission is to help you create, implement, and maintain your individualized plan for health and wellness.